It is not very often that we go to Makati, the country’s financial district. But my daughter needed to be there on two consecutive days – one for their Technical Dress Rehearsal and another for their actual performance. The timing was also bad – my husband couldn’t drive, it was a payday weekend and there were numerous sales in almost all the malls in Metro Manila. So we decided to stay overnight at the Picasso Boutique Serviced Residences. It was the only place within walking distance to and from RCBC Theater where my daughter’s rehearsal and performance were going to be. Fortunately for us, Deal Grocer offered a room there at a discount. I like the overall feel of the Picasso. There is art everywhere. There are paintings by the corridor. There is even an art gallery. We got the Malaga Studio and asked for an extra bed for our son. The room had a queen sized bed, a small kitchen, a study area and a balcony. The Deal Grocer voucher we got included P300 purchase from the minibar and breakfast for two at the Pablo (their ground floor restaurant). The room is spacious, even with the addition of an extra bed. Temperature of the airconditioner was just right, a welcome relief from the blistering heat outside. The art was evident even in the trash can and key card. Wi-Fi was pretty good, you just needed to get the username and password from the front desk. Water pressure in the bathroom was good too. One thing about the bathroom, though – there are no doors to provide privacy for the shower and toilet areas, just one door for the whole bathroom. Other great things about the Picasso were location and service. It is within walking distance from a lot of restaurants, convenience stores, and the Salcedo Park. They also provide a shuttle service to many of the Makati malls. Everyone in the staff provided excellent service. 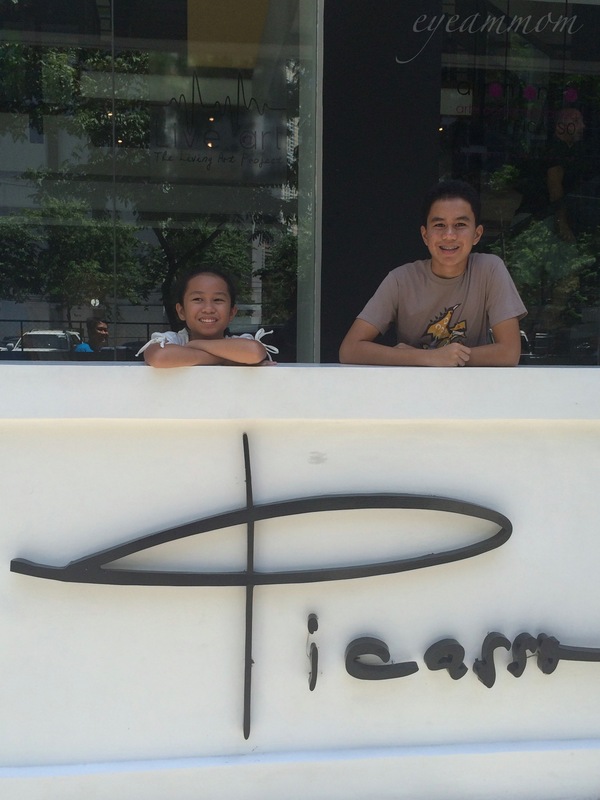 We were very happy with our stay at the Picasso Boutique Serviced Residences. We would gladly return if we need to be in the area again. 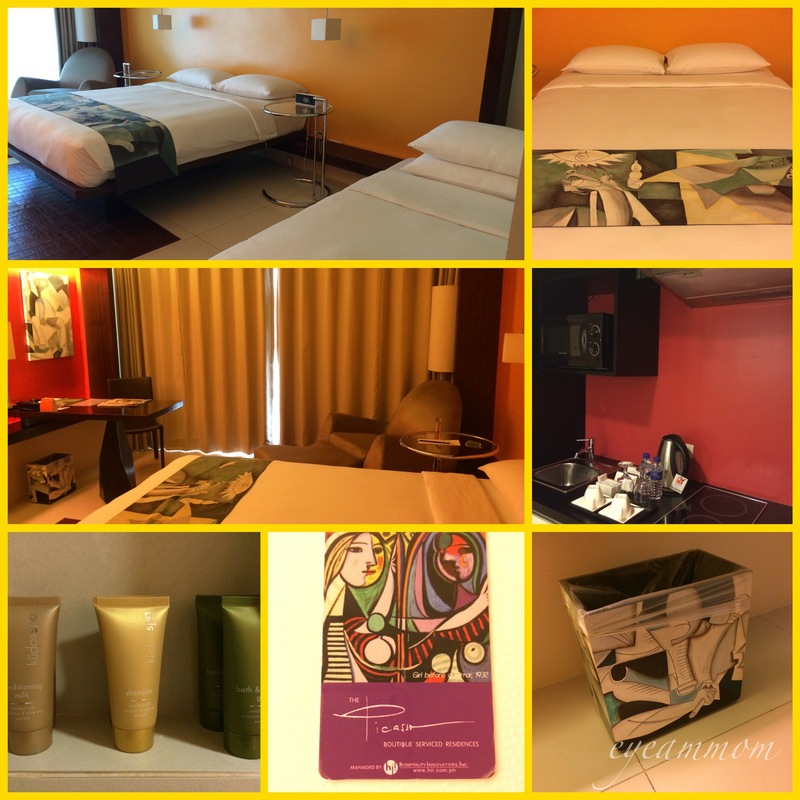 This entry was posted in Family, Life in the Metro, Vacation and tagged Deal Grocer, Makati, Malaga Studio, Picasso Boutique Serviced Residences, Salcedo. Bookmark the permalink.